As most of you know Kyle & I just got back from a trip to Nashville, Tennessee. Prior to traveling, I knew I wanted to find a bag that would double both as a purse and as a backpack, and I'm happy to share I found the perfect bag! This all-leather backpack comes in at under $100 dollars so it doesn't break the bank yet has great quality. 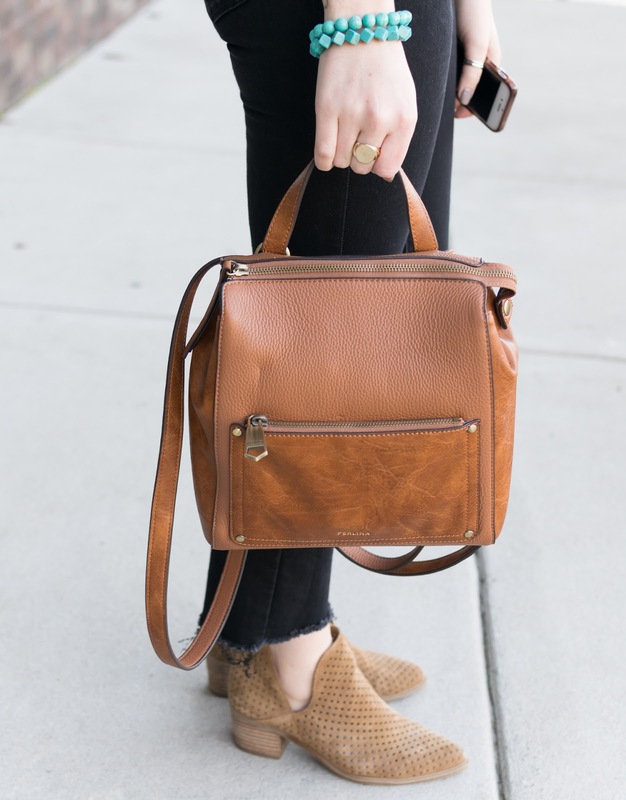 This backpack was perfect for using on the airplane as well as exploring Nashville. I loved the size of it as it fits all of my essentials plus some. The design of the backpack allows you to move the straps to wear it as a purse or take the straps off completely and carry it by the top handle. For our first day of exploring I paired my backpack with an all-black outfit including my favorite cropped jeans (currently on sale)! These are extremely flattering and give your body some nice curves, they are also great for transitioning from winter to spring. For a top, I wore a graphic tee as it felt very "Nashville" to me. In this city, there was a lot of distressed denim & t-shirts so I fit right in! Overall I loved the style of this city, very cool and casual. 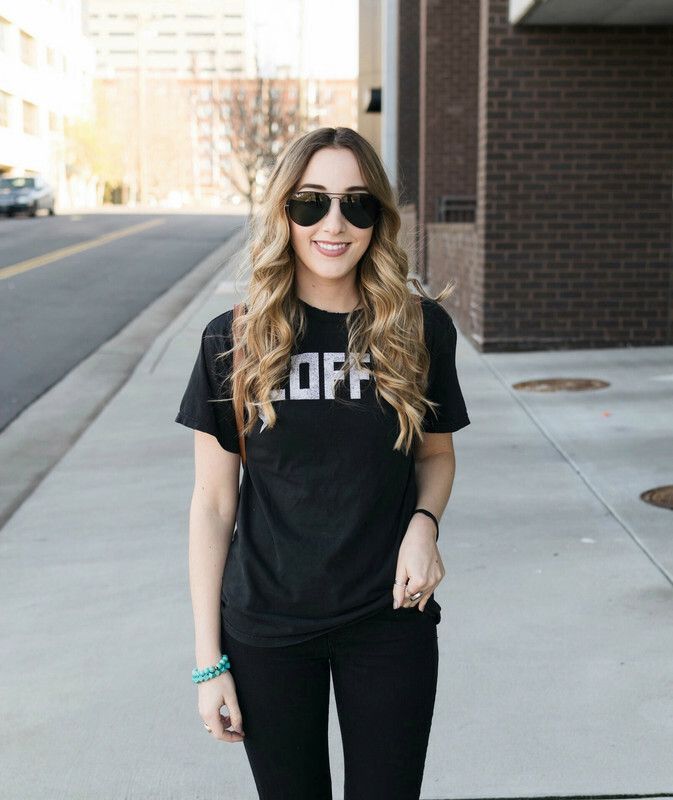 If you're traveling to Nashville soon this would be the perfect outfit to pack, and if you're not this would be a great outfit for any weekend errands or brunch dates! Your style sounds like it fit perfectly in Nashville (and looks like you guys had good weather for the trip too)! So glad y'all got to visit there, now I want to go! Such a cute look, I love the backpack!! ohhhh pretty!! can you do a hair tutorial? ;) i want curls like yours!!! I'm loving this everyday look! So darn cute! ahh such a cute look! I actually had those boots but they looked funny on my legs so i had to return, still so in love with them on others though!! Such a cute look! I'm really digging the shoes and bag! Love love this all black look! This is so me, and that bagpack is cute! What a great outfit! Comfy and chic is the way to go! I love the boots and the backpack! I love the bag - so cute and original! My kind of laid-back outfit-- love it! This is so definitely perfect for Nashville, too! Your shoes are KILLER and I am loving those pants too! Such a cute look black jeans so amazing.